This is a Rainbow Div. uniform patch. This one was never used. I suspect that Grandpa may have gotten this even after he was discharged, pehaps at a reunion. Long Island, New York near Mineola, NY. This was a tent camp formed specifically for the mobilization of the 42d Div. Shortly thereafter abandoned, and then re-established in April, 1918. Douglas McArthur (then Col. McArthur) gave the 42d Div. the name The Rainbow Division. This was because the 42d Div. was made up of National Guard units from many different states, and hence it was a Rainbow of representation of the States. See the comments page for more details about the 42d. If you know who any of the other men are, please e-mail us. I got your letter last night and was glad to hear from you. We got paid Sunday forenoon and I have been waiting for a pass so I could get some pictures and get a post office order. I guess I will get it tonight for 24 hours. They have been issuing clothes, all heavy winter stuff. I got 2 uniforms & 2 pair shoes, hat, shirts, wool underclothes, gloves, socks, and an over coat allready and will get a lot more stuff pretty soon. We get an entire new set of equipment except rifles and mine was new when I got it at Marion. We took an 8 mile hike yesterday and saw a lot of pretty country. There are some fine residences around Hempstead that is the closest town. It is about as big as Delaware. I would like to see Edna and the Kid but there is no chance now. We get up at 5:30, breakfast at six, drill at 7:30 to 11:30, then dinner at 12 and go out to drill again at 1:00 o'clock till 4:30. Then supper at 6 and tatoo at 9:00, call to quarters at 9:30, and taps at 9:45. We don't drill Wed. afternoon or Sat or Sunday at all. Church at 8:30 Sunday Morning. They keep us pretty busy you bet. We had a dress parade last Sunday afternoon and there was certainly some crowd out here. There are tents as far as you can see in every direction and more troops coming in all the time. We had another examination last week and one today and I think we will get another one yet. I passed all right so far. We lost one man in the first one, that little fellow that was out there and shaved that Sat. afternoon last summer. Well I just seen the first Sergeant and he said I could have my pass so I guess I will start getting ready. When I get those pictures I will send them all to you and you can send them to the rest of them. Will write more tomorrow. A.D.B. Well I guess I will finish now. Am sending you an order for some money. Use it any way you want to. Don't know whether I can get any pictures here or not. Had one of our squad taken yesterday. Will send you a couple of those anyway whether I get the others or not. Am sending you those pictures tonight, Did you get that money order all right? I ought to have heard from you by this time I think. We are liable to leave here any time so always put your name and address on the letters. 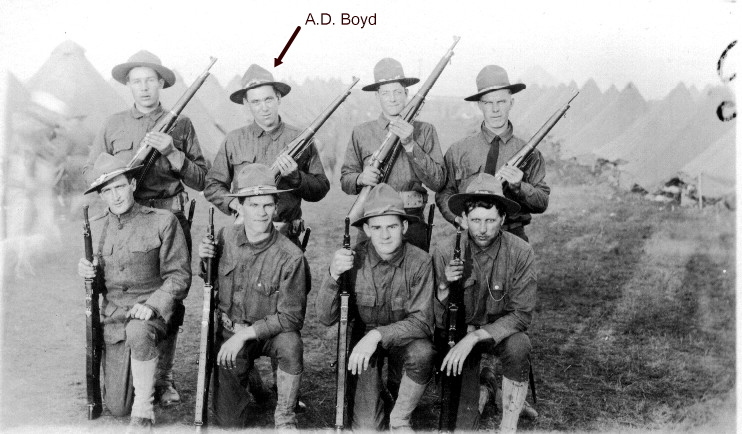 When we do leave, address your letter to Private A.D. Boyd Co. D 166th 42nd Division, American Expeditionary Forces. Will write more later. A.D.B. I got your letter today and got the magazine yesterday, got the letter about the money order the day after I sent the pictures. We have been having nice weather here, pretty dry too. We haven't been doing anything much except showing off for a week. We signed the the payroll yesterday and were mustered in for pay today. Had another big parade again today too. I think we will leave here soon as we are paid but I don't know. Was them pictures broke up any? I didn't have much chance to fix them up. I am writing this in the Y.M.C.A. and it is full of fellows writing. We have all our equipment now and we won't be here very long. We don't take any cots or tents with us. They give us all barrack-bags and that is all they will ship for us, the rest we take on our backs. I think we will be in France by Thanksgiving anyway or else on the way. It will be one nice trip. There didn't anyone die in our company, he just got turned down on the physical exam. His name was Clarence Burke. Did Cary say anything about me? I never been sick a minute since we have been in camp. Well I guess this is about all. I just got your letter and thought I would answer it as I have nothing to do. I am on guard duty but am done now till 5:30. Gov. Cox was here Thur and reviewed the Ohio Troops and after that he made a speech. I was only about 10 feet from him and I don't think much of him but he is a good talker. I am sending you my discharge from the National Guard. It don't amount to much, only if the war was over they couldn't hold us any longer. There won't be any guard when we are discharged this time, before there was. There is another big review tomorrow for Vice President Marshal. We are looking for pay day any time now. The 165th men got paid yesterday. There was a lot of ammunition came yesterday. I don't know what for, maybe they will issue it before we leave. We just got orders to have everything packed by 4 o'clock tonight but that don't mean we are going to leave. The N.Y. Troops packed up a week ago and they're here yet. We hiked about 8 miles yesterday with all our equipment but ammunition and some of the boys were pretty tired. It didn't bother me any. This is a picnic compared with ditching, believe me. Well I guess this is about all I can think of now. P.S. Well I just got off guard duty again. We had to relieve the other men while they packed up. I won't have time to write anybody else tonight. I don't know how long we will be here yet but it won't be very long. The transports are over here now ready to go. Will write again as soon as I can. Don't know when though. Well I guess this is about all.